John Hunt was born in Rainhill in 1891. 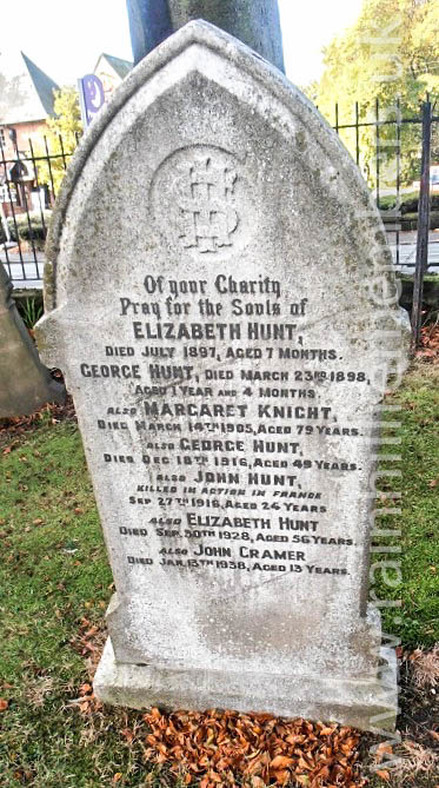 He was the son of George and Elizabeth Hunt, who were living at 5, Victoria Street, Rainhill with Elizabeth’s widowed mother, Margaret Knight. John was a quarry worker. By 1911, the family had moved to 26, Bretherton Road, Whiston and John is listed as a colliery worker, below ground. John enlisted into the army in Liverpool and joined the 6th Battalion of the Border Regiment as Private 4356. The 6th Battalion was formed in 1914. At some stage, John was promoted to Lance Corporal. John’s battalion left for France on 26th November 1914 and he was killed in action on 27th September 1916 aged 24. In the months before his death, he saw action on the Western Front at the capture of Wundt-Werk and the battle of Flers Courdette. John is commemorated on the family gravestone in St. Bartholomew's Churchyard, Rainhill.